Preheat oven to 180°C/350°F. Mix flour, sugar, baking powder, and half of the vanilla sugar in a bowl with the hand mixer. Cube the butter and add it to the bowl with the egg and mix to combine. Clean and hull strawberries. Toast sliced almonds in a frying pan until they start to brown and become fragrant. Grease a baking pan and transfer the batter to the pan. Bake at 180°C/350°F for approx. 20 min. Whisk the mascarpone cheese, milk, and remaining vanilla sugar in a small bowl. Remove cake base from the oven and let it cool down. Place a plate over the cooled baking pan and invert the cake onto the plate. 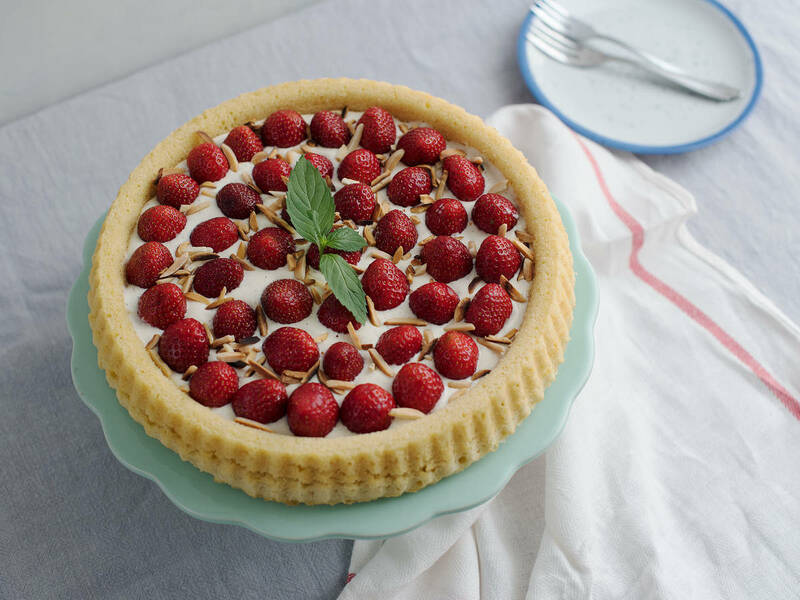 Spread the mascarpone mixture over the cake and place the strawberries on top. Sprinkle with toasted, sliced almonds and decorate with mint leaves. Slice and enjoy!